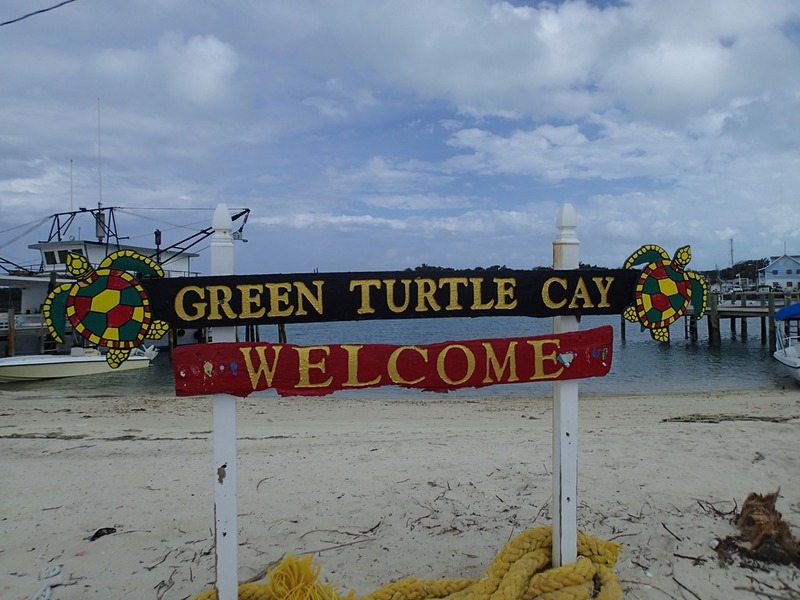 We anchored in White Sound at Green Turtle Cay yesterday, on our way northbound. 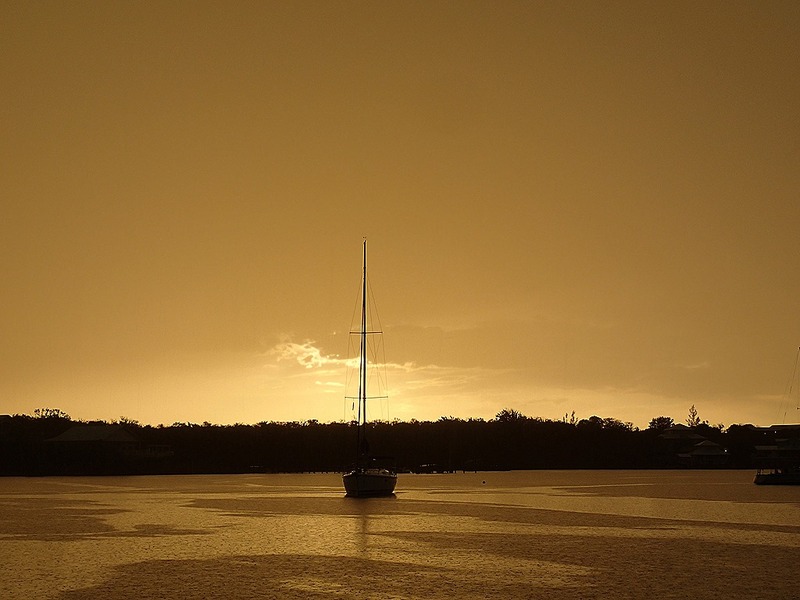 This was after a beautiful sail up from Man O’ War Cay in 15-20k from the SSE, with just the headsail. Very nice. We spent Saturday here because squally weather was predicted. No storms all morning so we finally decided to dinghy to shore. 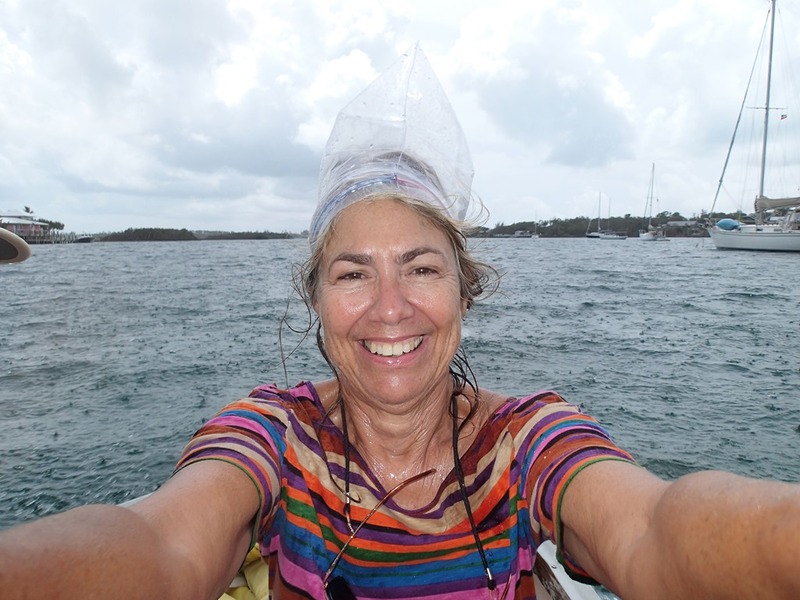 It rained hard on the way back to the boat – you can see the splotches of rain on the water around me – so I made myself a really cute rain hat out of a ziploc bag. Don’t try this at home – the fashionistas will slaughter you. Hahaha. And rightfully so. But it was really pouring and my solar hair dryer wasn’t going to work today. Look at this bar we found in New Plymouth on Green Turtle – cool decorations or what? This, you COULD do at home. 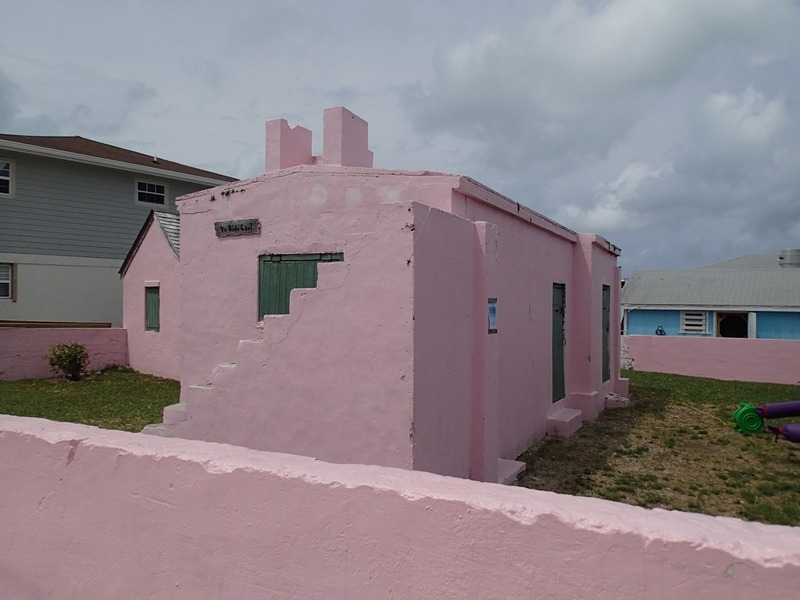 And there was this cute pink jail, a/k/a gaol. All day, storm clouds passed overhead. We finally got hit about 5 pm. A bit of wind – maybe some 25k gusts – and then a lot of rain with magnificently loud thunder and impressive lightning. Always a good feeling to NOT have the tallest mast in the anchorage. It blew enough for three boats to drag their anchors. Although two don’t really count because they were charter boats, which NEVER have sufficient ground tackle to safely anchor. Luckily they were all able to start their engines and motor around in the rain until they could finally get to one of the two marinas here. When the rain let up, the sky was a freaky copper color. 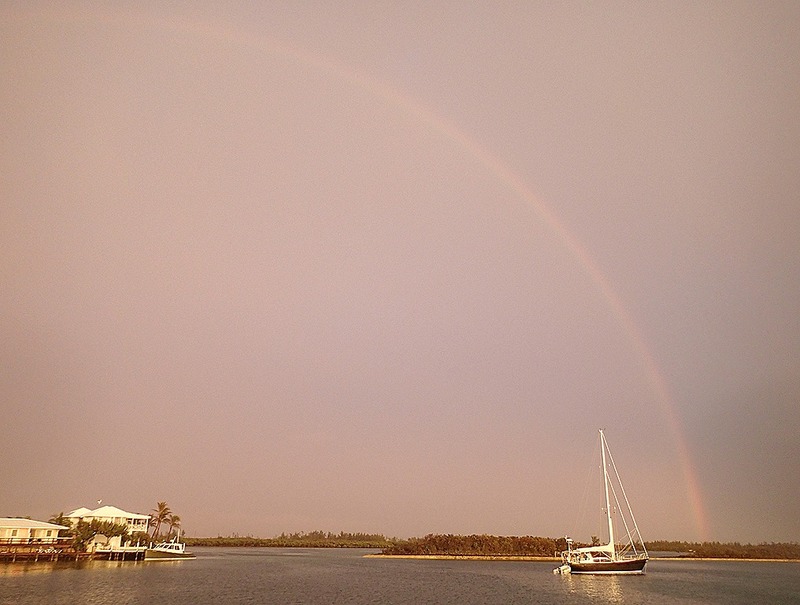 And then – a full rainbow. 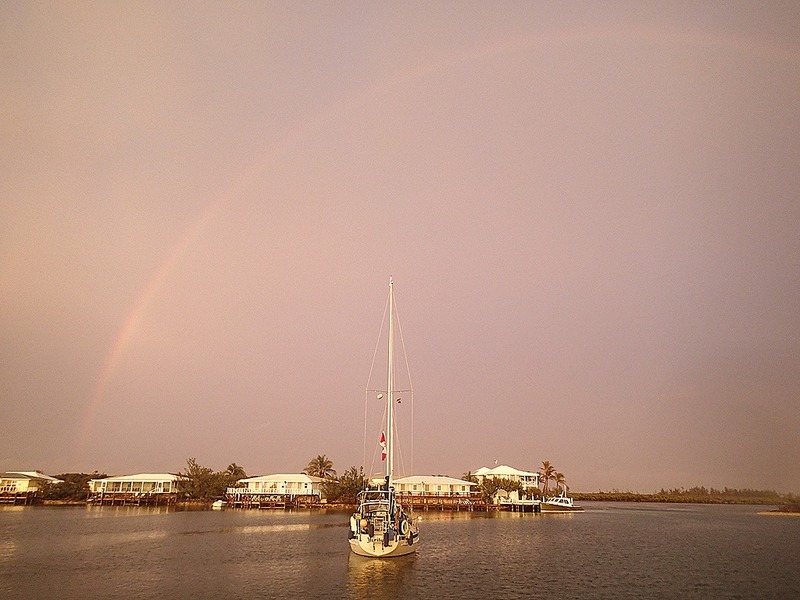 Here is one side – by our friend George’s boat. And here is the other. Then lots more lightning and thunder in the distance. We are hoping for a calm night and an early start Sunday morning to Great Sale (an island, not a shopping experience). Possibly a crossing early this week, weather dependent: looking at an overnight, Monday – Tuesday, to Fort Pierce. Fair winds and following seas are predicted. Fingers crossed. I can’t believe it is time to go home yet. It has been wonderful to be able to spend the winter reading your posts. I am so happy that the two of you are doing the things you have always dreamed about. Hope you have many more winters of wonder. Thanks so much. Hope you are doing well too. Where are you guys planning to be during those hurricane months? As we are starting cruising just now, this bothers me a bit…We are planning to be somewhere in the Bahamas, but where I don’t know…Any suggestions? We are on our way back to Annapolis. 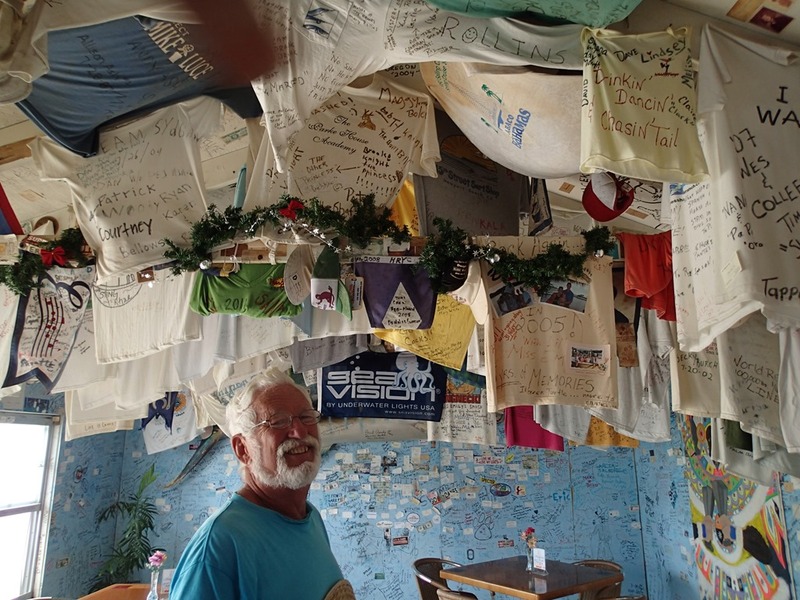 In Abaco, people leave their boats in Hopetown and Man O’ War and Green Turtle either on a mooring or at a marina; we talked with cruisers whose boats fared very well in Hurricane Sandy. There are probably similar safe locations in the other islands. That yellow sky shot is awesome!! Safe sails for the trip back to US. I know it’s hard to leave all that wonderful green/blue water, walks on the beach, wonderful food, and great times. What an experience for you.